The aim of this first guide is to get a Phoenix application up and running as quickly as possible. At this point, we should have Elixir, Erlang, Hex, and the Phoenix archive installed. We should also have PostgreSQL and node.js installed to build a default application. A note about webpack before we begin: Phoenix will use webpack for asset management by default. Webpack’s dependencies are installed via the node package manager, not mix. Phoenix will prompt us to install them at the end of the mix phx.new task. If we say “no” at that point, and if we don’t install those dependencies later with npm install, our application will raise errors when we try to start it, and our assets may not load properly. If we don’t want to use webpack at all, we can simply pass --no-webpack to mix phx.new. A note about Ecto: Ecto allows our Phoenix application to communicate with a data store, such as PostgreSQL, MySQL, or MSSQL. If our application will not require this component we can skip this dependency by passing the --no-ecto flag to mix phx.new. This flag may also be combined with --no-webpack to create a skeleton application. To learn more about mix phx.new you can read the Mix Tasks Guide. Phoenix generates the directory structure and all the files we will need for our application. When it’s done, it will ask us if we want it to install our dependencies for us. Let’s say yes to that. Once our dependencies are installed, the task will prompt us to change into our project directory and start our application. Phoenix assumes that our PostgreSQL database will have a postgres user account with the correct permissions and a password of “postgres”. If that isn’t the case, please see the Mix Tasks Guide to learn more about the mix ecto.create task. If we choose not to have Phoenix install our dependencies when we generate a new application, the mix phx.new task will prompt us to take the necessary steps when we do want to install them. By default Phoenix accepts requests on port 4000. 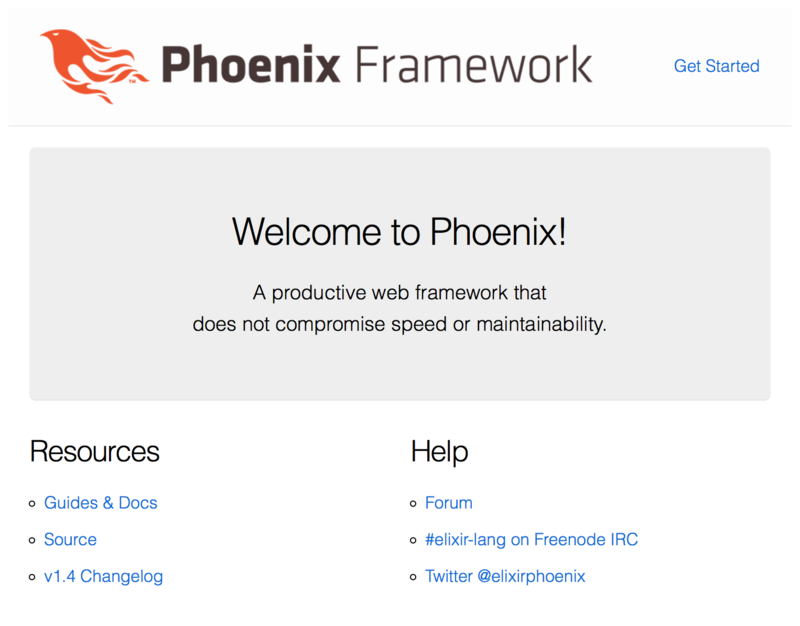 If we point our favorite web browser at http://localhost:4000, we should see the Phoenix Framework welcome page. If your screen looks like the image above, congratulations! You now have a working Phoenix application. In case you can’t see the page above, try accessing it via http://127.0.0.1:4000 and later make sure your OS has defined “localhost” as “127.0.0.1”. Locally, our application is running in an iex session. To stop it, we hit ctrl-c twice, just as we would to stop iex normally. The next step is customizing our application just a bit to give us a sense of how a Phoenix app is put together.